'Bloodbath' In Cairo As Troops Move On Morsi Supporters : The Two-Way Scores were killed when security forces cleared sites where supporters of ousted President Mohammed Morsi had been camped. Vice President Mohamed ElBaradei, a Nobel Peace Prize laureate, has resigned in protest over what he says was unnecessary bloodshed. 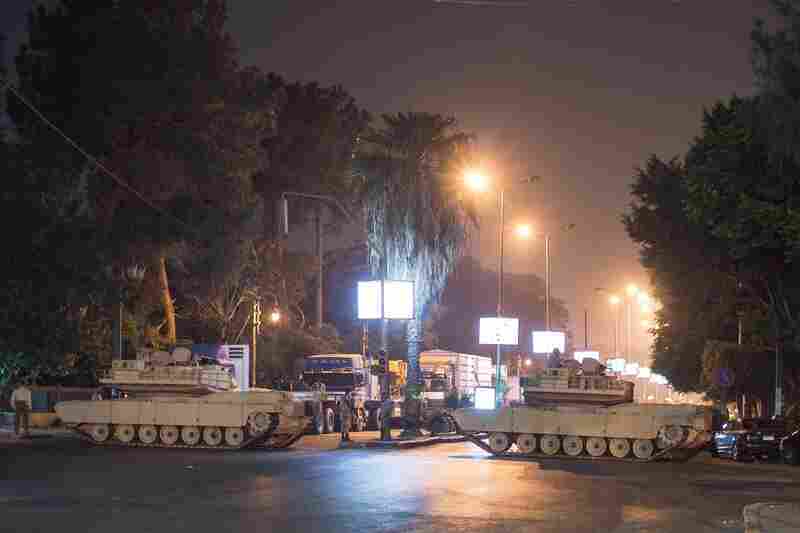 Two Egyptian army tank block a street during the first day of curfew in Cairo, Egypt on Wednesday. Egyptian police in riot gear swept in with armored vehicles and bulldozers to clear two encampments of Morsi supporters. Supporters of ousted President Morsi clash with security forces in Alexandria, Egypt on Wednesday. Egypt's interim Prime Minister Hazem Beblawi defended the government's actions, saying the crackdown was necessary to restore security and he also praised the police for self-restraint. Morsi supporters push over a truck during protests in Giza, near Cairo. Egyptian Vice President Mohamed ElBaradei, a Nobel Peace Prize laureate, also announced his resignation. He tied his departure to his disapproval of Wednesday's violence. Morsi supporters shout slogans in Cairo's Nasr City. In a televised statement, U.S. Secretary of State John Kerry called for a political resolution, saying that "violence is simply not a solution in Egypt or anywhere else." A supporter of ousted Islamist President Mohammed Morsi throws a drinking glass during clashes with Egyptian security forces in Cairo's Nasr City district, Egypt, on Wednesday. A Morsi supporter reacts after identifying the body of a dead family member at of the Rabaa al-Adawiya Medical Center in the Nasr City. 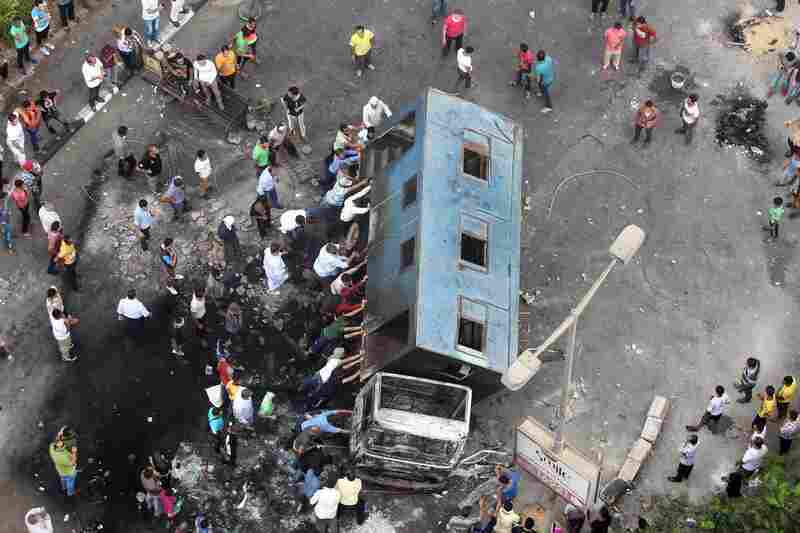 The Egyptian ministry of health reported 275 people had been killed and 2,001 had been injured across the country. The government said 43 policemen had been killed. 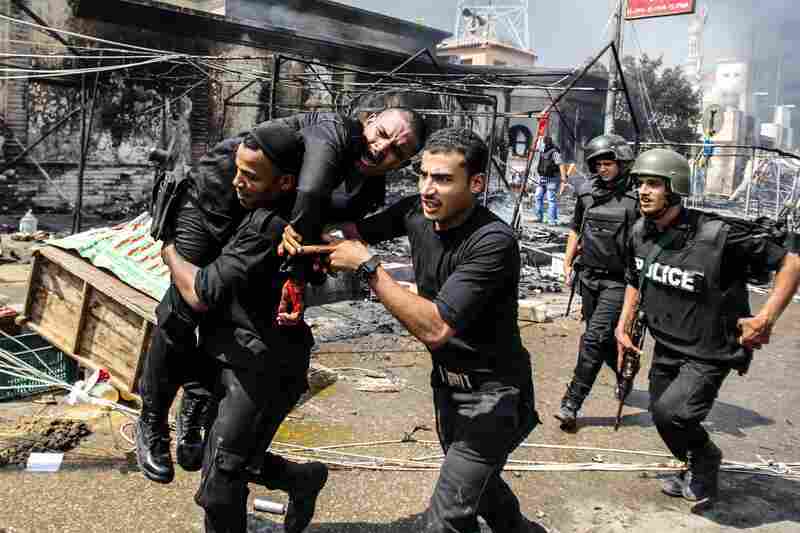 Policemen carry a wounded soldier near the Rabaa al-Adawiya mosque in Cairo. Police have taken full control of the two major squares Morsi supporters had occupied for several weeks. 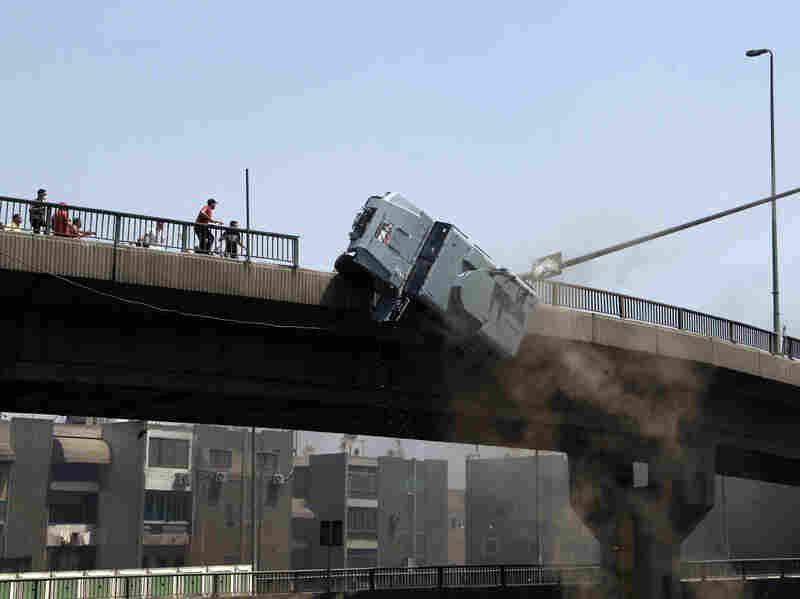 Protesters pushed a police vehicle off of the 6th of October bridge in Nasr City. 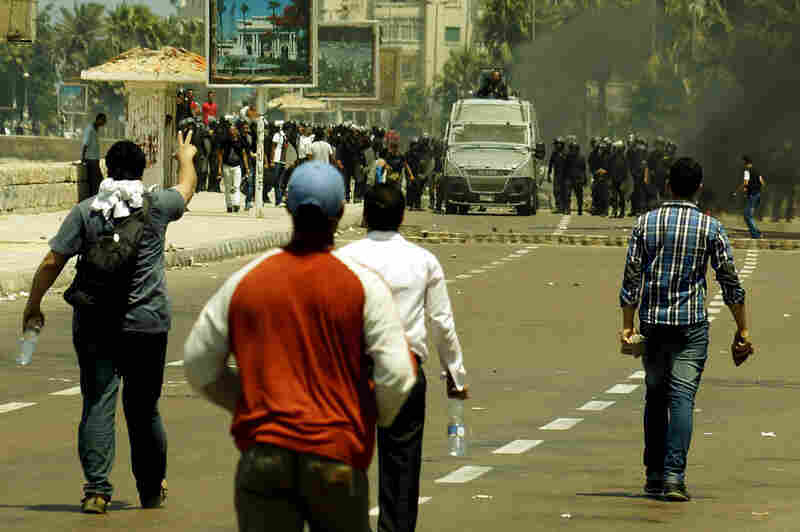 "It looks like a war zone," NPR's Leila Fadel reported from Cairo. 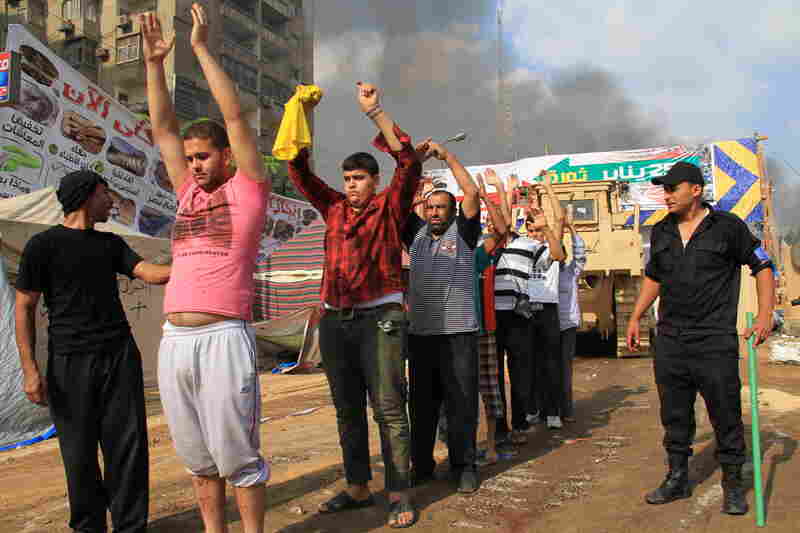 Security forces detain Morsi supporters. Protesters were showered with tear gas, as the sound of gunfire rang out from both camps. 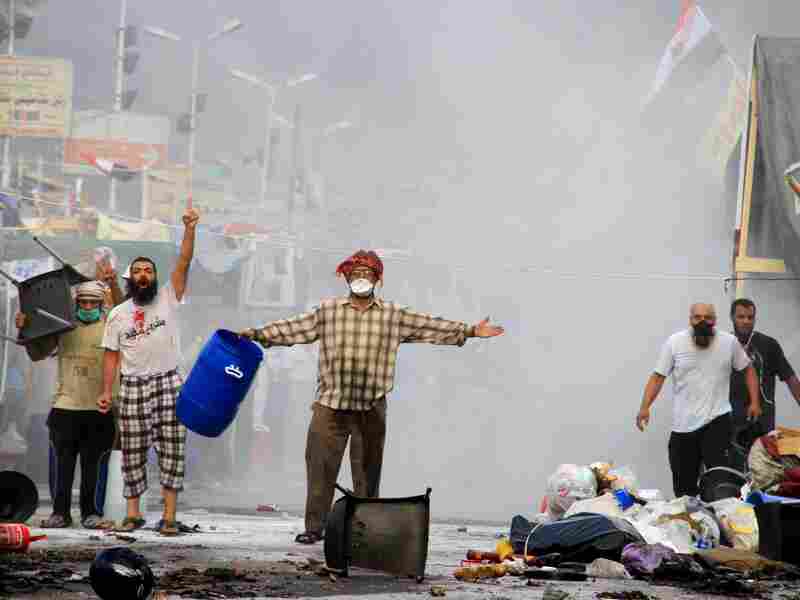 Protesters taunt security forces moving in to clear one protest camp near the Rabaa al-Adawiya mosque in Cairo. The military-backed government described the camps as violent and unlawful. 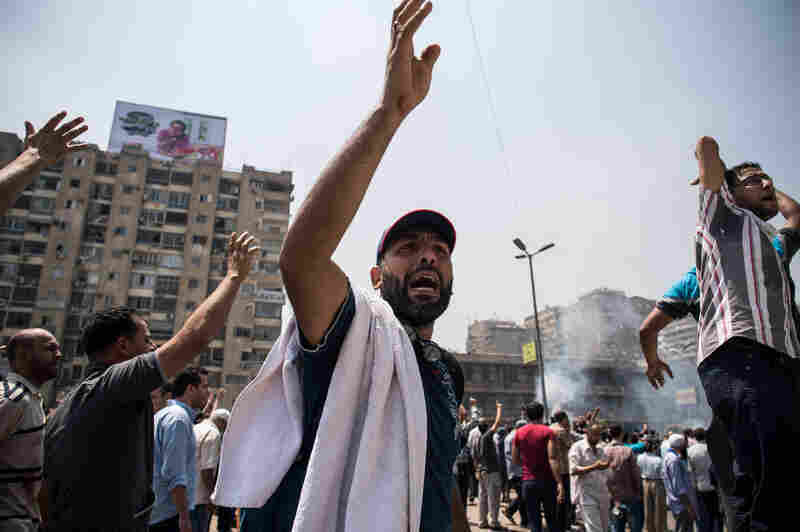 In what looks to be the bloodiest day since the July 3 ouster of President Mohammed Morsi, dozens of people in Cairo were killed Wednesday as government forces moved to clear Morsi's supporters from sites where they have been camped. By evening, the ministry of health reported 275 people had been killed and 2,001 had been injured across the country. The government said 43 policemen had been killed. "I saw that there were peaceful alternatives to dispersing this social clash and there were acceptable solutions proposed to lead us towards national reconciliation," ElBaradei wrote in his resignation letter. "It is now difficult for me to continue to bear responsibility for decisions that I do not agree with and to which I fear their consequences and I cannot bear responsibility for a single drop of blood before God, before my conscience, and before my citizens, especially as I believe that the bloodshed could've been avoidable. "Thus unfortunately those who gain from what happened today are those who call for violence, terror, and the more radical groups. And you will remember what I have told you and I delegate my matter to God." The interim government, meanwhile, declared a state of emergency and blamed Morsi supporters for the violence. Egypt's interim Prime Minister Hazem Beblawi defended the government's actions, saying the crackdown was necessary to restore security and he also praised the police for self-restraint. The events brought a rebuke from the Obama administration. "Strongly condemns the use of violence against protesters in Egypt. We extend our condolences to the families of those who have been killed, and to the injured. We have repeatedly called on the Egyptian military and security forces to show restraint, and for the government to respect the universal rights of its citizens, just as we have urged protesters to demonstrate peacefully. "Violence will only make it more difficult to move Egypt forward on a path to lasting stability and democracy, and runs directly counter to the pledges by the interim government to pursue reconciliation. We also strongly oppose a return to a State of Emergency law, and call on the government to respect basic human rights such as freedom of peaceful assembly, and due process under the law. The world is watching what is happening in Cairo. We urge the government of Egypt — and all parties in Egypt — to refrain from violence and resolve their differences peacefully." In a televised statement, U.S. Secretary of State John Kerry called for a political resolution, saying that "violence is simply not a solution in Egypt or anywhere else." Kerry called what happened Wednesday "deplorable" and said the U.S. "strongly opposes" a "return to a state of emergency." The day's events were almost sure to renew calls from some U.S. lawmakers that aid to Egypt — much of it to that country's military — be cut or suspended. As the sounds of gunfire rang out across the city and smoke billowed, Leila told Morning Edition host David Greene that even though it was "impossible to confirm" the number of deaths because journalists weren't being allowed to get close to the action, it appeared there had been a "bloodbath." At one hospital she visited, Leila added in messages to the NPR newsroom, she counted at least 37 bodies. 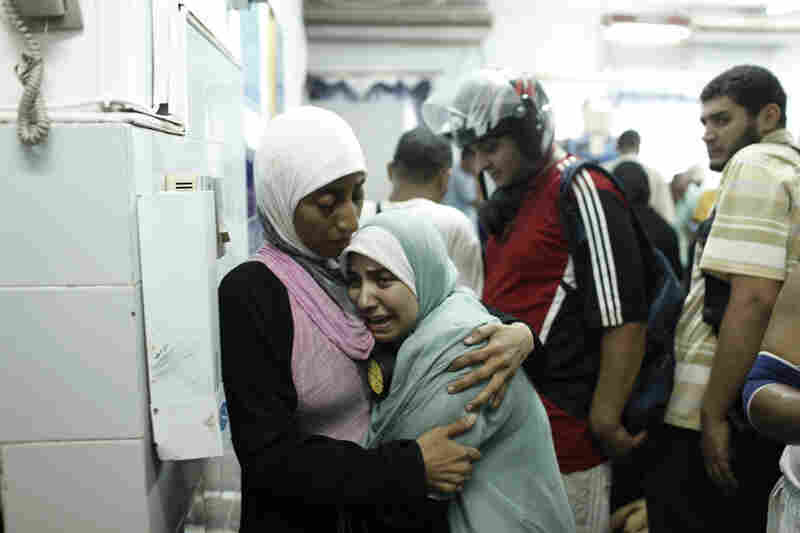 Although the vast majority of the victims were Egyptians, at least two journalists were among those killed. One was a Sky News photographer, according to that news outlet. The other was a reporter for the Dubai-based Gulf News. In an interview with All Things Considered's Robert Siegel, the Egyptian ambassador to the United States Mohamed Tawfik said the clashes started after security forces surrounded the two main sit-ins in Cairo. "Members of the Muslim Brotherhood started shooting at police," he said, which meant they had to move in quicker than first planned. Robert pressed him, asking him if that justified the killing of women and peaceful protesters and if that justified the snipers NPR's Leila Fadel had seen during her reporting. Tawfik said there was conflicting information — that it was the Muslim Brotherhood who had sent snipers to the rooftops. The security forces, he said, lost 43 policemen, after all. "The sit-ins," he said, "had become a source of criminality," so action had to be taken. We'll continue to focus on reports from authorities and news outlets with reporters at or near the scene and update as more information comes in. "It looks like a war zone," NPR's Leila Fadel reported from Cairo Wednesday morning as she spoke with Morning Edition host David Greene about a move by Egyptian security forces to clear supporters of ousted President Mohammed Morsi from camps in the city that they have been occupying for weeks. At one camp in eastern Cairo, she said, security forces have surrounded the area, smoke is billowing and there is the sound of gunfire. Videos have shown "dozens of corpses," Leila said. The Associated Press reports that one of its video journalists at the scene "said he could hear the screams of women as a cloud of white smoke hung over the site in the eastern Cairo suburb of Nasr City." As often happens when news such as this is breaking, there are conflicting details. NBC News is saying that "at least 15 people were killed." Al-Jazeera reports that "at least 40 people died." Leila says "the official number is 10," but that the Muslim Brotherhood (from which Morsi hails) "is saying that hundreds are dead." We'll update as more news comes in from Cairo and elsewhere in Egypt. Leila says there are reports of clashes in Alexandria, Suez, Luxor and other cities. Determining exactly what's going on is difficult, as The Wall Street Journal reports: "The Egyptian army blocked reporters from going to the scene, violating earlier promises the police made to invite the press and human rights activists to observe the clearing of the sit-ins, amid concerns of police brutality." Morsi was removed from office by Egypt's military on July 3. His ousting followed huge protests against the president's year-old government — the first to have been democratically elected in Egypt's history. Millions of Egyptians took to the streets to express their anger about Egypt's stalled economy and what they saw as anti-democratic moves by Morsi and his Muslim Brotherhood colleagues. Interim President Adly Mansour, who had been the Supreme Constitutional Court chief justice, and Egypt's generals have promised that there will be new elections in coming months.